Video installation, Trondheim's Art Association, 1991. A video documentation of the installation Redroom/Eyemachine was produced. This documentation was re shot with a close-up-lens on an infrared sensitive black & white tube video camera. The lens was placed close to the screen just selecting a fragment of the original image. Then this re filmed version of the documentation was re filmed all over again and so on in all 9 steps. In the installation I used step 4, 5, 8 and 9. At each step you came closer to the video pixels and the speed of the light pulses and flashes increased. 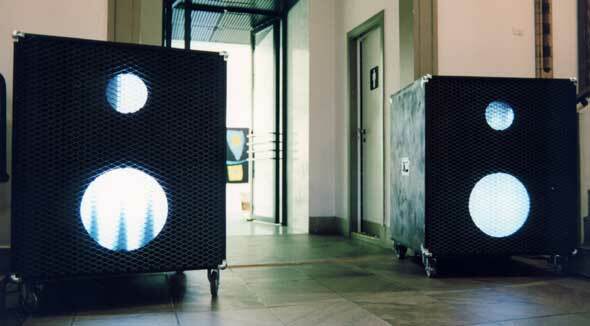 The Light-Speakers were designed to resemble us of really heavy stage speakers to go with heavy music. Inside each speaker there were two VHS-players and one 14 '' tv and one 25 '' tv. The Light-speakers were mute instead they played with light.